Adding multiple radios into a single housing is not a unique approach. Most everyone on the market starts with two radios in their Access Points and you can even find a handful of three-radio solutions, but Xirrus takes this approach to the next level by stacking as many as 16 radios into a single Access Point! The challenge that other manufacturers do not need to address is overlap. In a standard two or three-radio approach, you typically operate one radio in 2.4GHz and the other in 5GHz (and for those rare 3rd radio guys, they usually stick that radio in monitor or listen-only mode). Tack some omni directional antennas on those bad boys and you’ve got yourself an AP! Xirrus however, intends to have multiple radios in a single AP operate on in the same frequency. This presents some challenges about the efficiency you can gain from having more than one radio in the same frequency in the same physical package (AP). At WFD5, there was much gnashing of teeth regarding how you accomplish this in one package. I’ll not go over the gory details, the video is posted here. Xirrus came back to WFD6 and brought with them their Director of RF Engineering, Avi Hartenstein and tacked the conversation head on. Ladies and gentlemen, you saw it here first (or maybe not) – the myth of the Xirrus wedge is real! You can see near the bottom of the image where the AP was placed (at random orientation). I peeled this wedge view out using Ekahau’s Site Survey application after quite a walk outside in the cold. This directionality is fairly easy to see even with my coarse sampling outside. It should be noted that it will be near impossible to visualize this dramatic of a wedge indoors however due to the prevalence of those pesky attenuators otherwise known as walls and furniture. 1) Orientation of the AP. The Xirrus array has a compass in it. 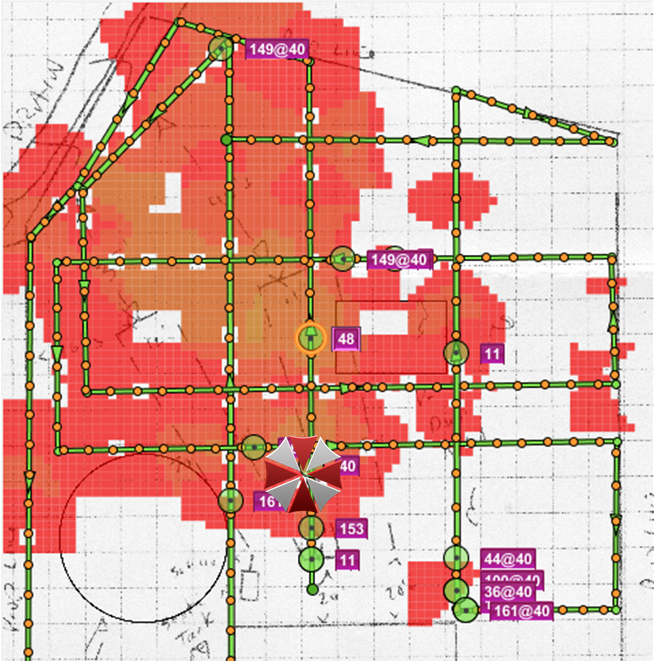 Use this compass to determine the orientation of your array during the survey and ensure that when it gets deployed that this lines up correctly (use the logo on the housing if you need to). You must pay close consideration to the number of uplinks to your array and balance this with your deployment expectations. Oversubscription is nothing new so don’t let this scare you – just be aware that you’re moving your uplinks (and potential bottlenecks) further up the line (closer to the AP). This is going to be particularly important as you consider updating your array to newer technologies such as 802.11ac. Ensure that you have made concessions for powering the array. This will likely require an external power injector but sourcing them along with the array should not be problematic. 4) Antennas change with the modules. One of the most insightful things I learned from the WFD sessions are a reinforcement that the antenna is part of the radio module. When you replace that module, you replace the antennas that are a part of that module. This could potentially impact the RF of your deployment and will most assuredly change the visualization of your survey data.